.NET Framework is developed by Microsoft, which supports the software programmed using .NET. Windows has built-in .NET Framework. And different version of Windows has installed different version of .NET Framework. If you want to successfully run these kind of software in your computer, your need to have .NET Framework installed. If Windows doesn’t have the specific .NET Framework version that your software requires, you need to install it manually. Following are the commonly used .NET Framework versions. If you need to install these versions, just click on the link to download the one that you need. If the version that you need could not be downloaded here, you can download it online. Just open your favourite browser and use keywords “specific version+ download” to search. 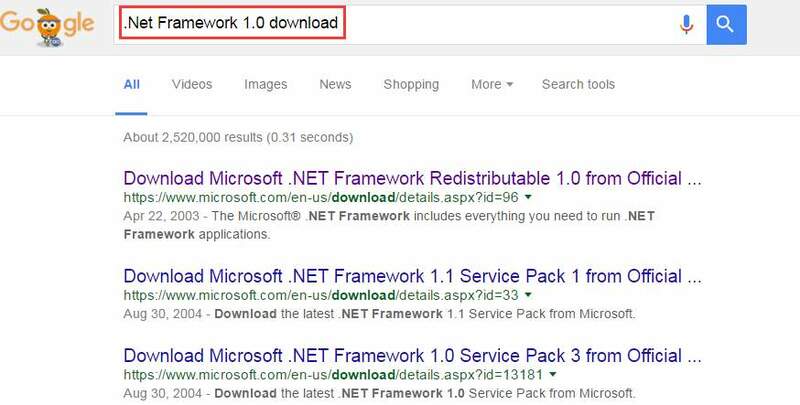 Let’s take downloading .Net Framework 1.0 with Google Chrome for example. Usually, the first result will be the download page for the .Net Framework that you wish to download. After download completes, you can install it by just double-clicking on the downloaded file and following the on-screen instructions.